So, have you ever thought it would be cool to be in one of those psycho killer horror movies like Texas Chainsaw Massacre, where this insane monster captures and throws you in some horrible little room for you to await your upcoming slaughter? 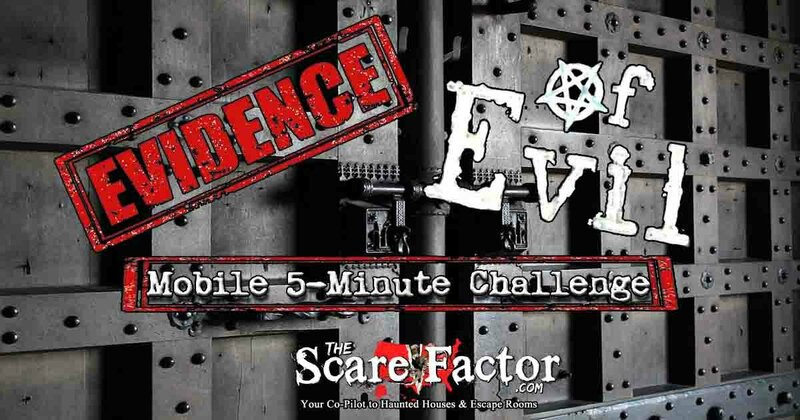 Well now you can experience being the victim in a movie where you are trapped by uncaring bloodthirsty creatures at Evidence of Evil Escape Room. It is only set to stick around until Halloween, and then may make it’s horrific return at a Haunted Attraction next season. I can honestly say it is the most intense experience I have ever had in an escape room for sure, and even more than any Haunted Attraction I’ve been to. What we didn’t know going in was what the prologue of the game involved… black hoods over our heads. Now, I know a lot of people will be like, “Oh no, you are not putting a sack over my head,” but trust me, it adds to the experience like 100%. How it works: We were given instructions (before the hoods were pulled out, naturally) that, once in the room, we would need to find two hidden keys; one of which would open a chest and another a book. What’s in the chest will help solve the puzzle in the book. Now, you might say I’m giving away what you need to do in the game, but it doesn’t matter. The brilliance of this game is in it’s simplicity; it doesn’t need to be complicated. I mean, you only have 5 minutes before the evil beasts return to eat you! So it’s all about intensity, immersion, fear, and an “I’ve never worked faster in my life” type of task. It was insane. The other brilliant part is that, other than changing the final puzzle configuration, you could literally play this game multiple times just as effectively by changing the location of the hidden keys so that, even though you know what you are looking for, you still need to find it… and time is running out. Speaking of time, there is no clock that I saw in the room, so you need to just bust it as fast as possible, all hands on deck, searching and finding the solution before the door opens and pig face and bear trap head come back. Okay, so you’ve been given the instructions, you’ve been put in a straight line, one behind the other, and this is where the hoods come out. With limited vision of only your feet or the lights around you, you are led as group with your hands tightly gripping the person in front of you as they lead you to your doom. Something is snarling in your ear, yelling, screaming and making all kinds of noise as you make your way to “The Chamber” where you will actually play the game. The intensity and your breathing is so pumped up by this that, by the time you get into the room and pull off your masks while other actors are screaming, it is full-on adrenaline time. You are just in a frenzied panic mode and have to fight to keep your mind and body under control while also scouring the room as fast you can because there is no time. Ultimately, the door did get smashed open by the two ruthless killers and my group would have been reduced to a pile of fleshy pulp and blood on the floor. But, I can say that we were close and, although only 2 groups to that point had successfully escaped, I feel that it was very doable in the time allowed and given the tasks needing to be done. It only made you want to play again because we felt like we could do it given another chance, and that, to me (as an Escape Room Enthusiast), is also exactly what an escape room should do, it should be fair and make you want to come back. Evidence of Evil, to me, will now be the benchmark and the template for how to do a 5 minute escape game perfectly. I can’t offer anything that would have made the game or the experience better, it could work with larger groups or two people, it’s completely replayable and it’s a lot of fun if you don’t mind the heart-pumping adrenaline this one offers. I am probably the calmest person you will meet and it took me probably an hour to settle down from this 10- to 15-minute experience with the hooded prologue added to it. The price is extremely reasonable; it’s $15 per person, but you get a $10 arcade card for the place where this is located, so the game itself only costs $5. It is located inside Crystal Bees, which is like an indoor amusement area with bowling alleys, a DJ, restaurant, bar and arcade. But hurry, as there are only a few weeks left to experience this awesome, intense escape room.